Dayton, March 15, 2019 - Dayton Dutch Lions FC’s Men’s team is close to finalizing its roster after six months of recruiting. More about the recruitment process and expectations for the upcoming USL League 2 season can be read in interviews with Head Coach Dan Griest and Assistant Coach Kevin Terrell at www.ddlfc.com. The team will play 14 games in the strong Great Lakes Conference to defend their 2018 conference title. They also qualified for the US Open CUP. The first game will be in May and will be announced soon after the draw. The Women’s team is making a comeback this year after a year off in 2018. The newly appointed Head Coach Eric Kissinger was a former player of the Men’s team for six years and was part of the inaugural team that started playing in 2010 in USL PDL. The schedule of the WPSL Women’s team features a lot of close rivalries with teams from Cincinnati, Columbus, Detroit and Cleveland. Three of the five home games (total of 10 regular season games) will be double headers with the Men’s team. The first game of the season for both teams is Saturday May 18 when the Women play at 4pm and the Men at 7pm. The club is scheduling several events at the opening weekend. Cincinnati Dutch Lions FC’s Men’s team is in the same conference again as Dayton Dutch Lions FC. Both teams play each other four times. The club announced the return of Dutch goalie Wesley Storm after a successful 2018 season as well as Cincinnati local Adam Snow. The opening game for the 2019 season is Friday May 10 vs West Virginia Alliance. The club recently announced a partnership with Southeastern Indiana Soccer Association for Youth.Both organizations collaborate to provide higher-level education to SISAY coaches and players. This partnership will also provide young players and their families exposure to the USL League 2. Former CDL player Kyle Smith made his debut last week in the MLS with Orlando City in a 2-2 draw vs New York City FC. He earned a start in Orlando’s 2ndgame in Chicago where they tied the Fire 1-1. The team, that will be led again by Head Coach Paul Nicholson, will train and play on brand new turf this year at Northern Kentucky University that was recently installed. Houston Dutch Lions FC is fully focused on their Youth Academy in 2019. Due to their growth in players they added a second location in Conroe. The Men’s NPSL team is taking a year off and will be back to play in 2020. Director of Soccer Operations Marco Pruis, who has been with the club since the start in 2011, was interviewed about his 7 years with the Dutch Lions FC and his ambition for the coming years. His interview can be read at www.dutchlionsfc.com. The club also had their annual Spring Break camp this week from Monday to Wednesday at their own soccer complex. Florida Gulf Coast Dutch Lions FC recently appointed local business man Mike Hollow as new GM. After qualifying for the championship game in the prestigious Weston CUP, three girls’ teams are currently ranked in the top 50 of the State: U12G is ranked 10th, U13G is ranked 32ndand U14G is ranked 48th. The U14G team also served their community during the “Feed my Starving Children” event at Challenger Middle School. A great gesture of the girls and their parents. 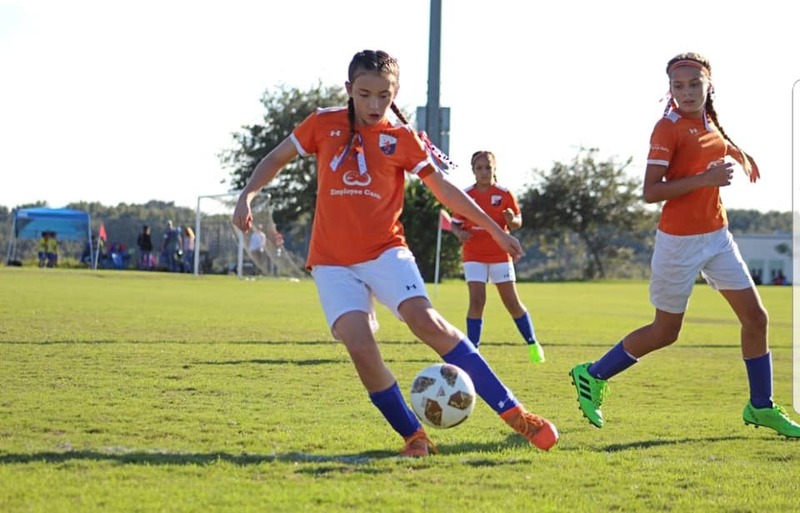 U12 player Alyssa LoGuercio was selected in the ECNL League with the Tampa Bay Rowdies. On March 2 the academy had their first 2019 Orange Family Event when the players and parents competed in a Bowling event. The WPSL Women’s team is defending their 2018 conference title starting June 2 when they travel to Florida Sol. They play their first three games on the road and have their home opener on Sunday June 16 at 2pm vs Florida Krush. More news about the first home opener and players will be announced the coming weeks. The club will also organize an open tryout in the first week of May. New York Dutch Lions FC is finalizing the location(s) and opponents for their annual games in the 2ndor 3rdweek of June as well as several World Star Clinics. They expect to announce their program before the end of the month. Former GM Simon Hochstenbach signed a contract with Dutch club AFC Ajax to become their Business Development Manager International Partnerships USA. FC Cincinnati played their first two MLS games. They had a tough debut in the MLS with a 4-1 loss on the road vs Seattle Sounders in front of 39,000 fans. Highlights, line-ups and stats of the game can be seen here: https://matchcenter.mlssoccer.com/matchcenter/2019-03-02-seattle-sounders-fc-vs-fc-cincinnati/recap. The team of Head Coach Alan Koch did pick up a big point away vs 2018 Champion Atlanta United on Sunday (1-1). Highlights of the game can be seen here: https://matchcenter.mlssoccer.com/matchcenter/2019-03-10-atlanta-united-fc-vs-fc-cincinnati/recap. FCC is returning to Nippert Stadium this weekend to play their home opener on Sunday the 17thvs Portland Timbers. The club already sold over 20.000 season tickets sofar and more than 30.000 tickets for the home openener.